Combines chicken, fish and liver flavored pieces to produce a taste that cats love. Formulated with a special balance of protein, fat, vitamins, and minerals. A standard 8 ounce measuring cup holds approximately 3.5 ounces of SPORTMiX® Gourmet Mix Cat Food. 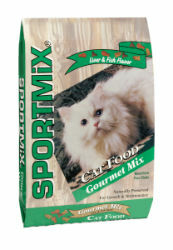 SPORTMiX® Gourmet Mix may be fed dry or moistened according to your cat's preference. Feed approximately 1/2 cup twice a day. Or fill your cat's bowl in the morning and allow your cat to nibble throughout the day. If served moistened, add one part water or milk to three parts of SPORTMiX® Gourmet Mix. The serving size may be adjusted based on your cat's size, age and activity level. Water is essential to your cat's good health; always provide plenty of clean fresh water. If fed moistened, feed only the amount that your cat will consume readily. Lactating cats may consume up to three times as much food as adult cats. Kittens can be fed SPORTMiX® Gourmet Mix moistened with milk or water; 4 times a day at 3-4 weeks of age in amounts that the kitten will consume in 10 minutes. At four months of age, the young cat may be fed as an adult. Feeding guidelines are per a daily basis. Use the chart as a guide and divide this amount into the desired daily portions. Feeding twice daily is recommended. Ground Yellow Corn, Soybean Meal, Corn Gluten Meal, Meat Meal, Chicken Fat (preserved with mixed tocopherols), Ground Wheat, Natural Liver Flavors, Menhaden Fish Meal, Choline Chloride, Brewer's Dried Yeast, Salt, Potassium Chloride, DL-Methionine, L-Lysine, Taurine, Calcium Sulfate, Added Color (FD&C Red #40, FD&C Yellow #5, FD&C Yellow #6, FD&C Blue #2), Vitamin A Supplement, Vitamin D3 Supplement, Vitamin E Supplement, Zinc Sulfate, Ferrous Sulfate, Niacin, Folic Acid, Biotin, Manganese Sulfate, Copper Sulfate, Calcium Pantothenate, Thiamine Mononitrate, Pyridoxine Hydrochloride, Riboflavin Supplement, Zinc Proteinate, Manganese Proteinate, Copper Proteinate, Calcium Iodate, Sodium Selenite, Cobalt Carbonate, Vitamin B12 Supplement.